stepping out in faith: Who wrote your operating system? Who wrote your operating system? My studies in Ed/Psych have forever ruined YouTube videos as entertainment. I can rarely just watch one and laugh; I now find I must analyze it. Here is a clip of a baby with a magazine that I plan to show my undergrads. When I try to tell them that technology changes the way children think, they just nod and then pretend to ignore their phone. 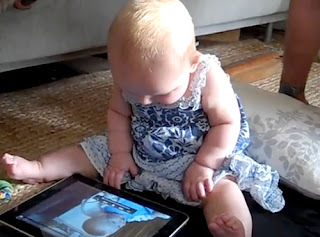 When we watch this baby try to move the pictures on a magazine cover the way she uses the tablet computer, then my words take on a new meaning. As the video states, the technology in her world has wired her to perform a particular action in order to learn. This baby expects that when she brushes her fingers over something she will see a change; she understands that this is an action that will bring on learning because she can manipulate it and because it brings something new to her senses. For most of us, when we were children, the equivalent action was to turn a page. Think of babies sitting contentedly with a cardboard book, patiently learning how to use finger and thumb to manipulate the page. Turning the page meant something new to learn. Just as uplifted arms mean seeking of comfort. The things we encounter in our environment have a significant effect in directing our learning. If we spend the day outside with nature, we learn differently than if we spend the day inside on the couch. A small change early on, sets the direction of learning. This is one reason why the American Association of Pediatrics does not recommend media or screen (TV, computer, game) activities for young children. It is not so much as what they are doing, as what they are NOT doing, that makes the difference. What we do on a daily basis influences and creates who we are. Let's put that in a more practical way: reading God's word on a daily basis influences and creates who we are. The reason God designed our brains to learn this way was so that we could continually adapt to our environment. A baby's brain, from before birth, is already preparing for communication. We know this because babies are born recognizing their mother's voice over other sounds. Likewise, the baby's brain begins to establish patterns for learning. Parents and siblings, as a source of information, become a guiding pattern. So does page turning, or more recently, screen flipping. Adult brains work the same way. When God leads us to seek wisdom in His word, the action of reading makes changes in our brain that lead us back to that source of learning. God's word will not return to Him void. He set the stage for that learning from the beginning of our existence. God has hardwired your operating system to seek His word and to learn from His teaching. You are His creation and He loves you.